You’ve no doubt heard HTTP is stateless, meaning a web server doesn’t know anything from one request to the next for the same client. Beyond news and information sites, however, a web application typically will need to know who you are and what you can do with it to be useful. 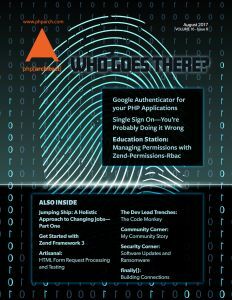 In this issue, we look at effectively handling authentication and authorization. Developers the world over were in shock this past May as thousands of computers in the UK’s National Health System were rendered inoperable due to a malware attack. Thanks to a previously leaked vulnerability in Windows’ operating system, and the notoriously slow rate at which large enterprises apply system patches, hackers were able to infiltrate and infect these systems with specific viruses.